High Speed 2 (HS2) is the new high speed railway line proposed to improve travel and connectivity both within the UK and also with connections to the Continent. It is designed to create space on overcrowded networks and enable large numbers of people to move more effectively. The line is to be developed in two phases. 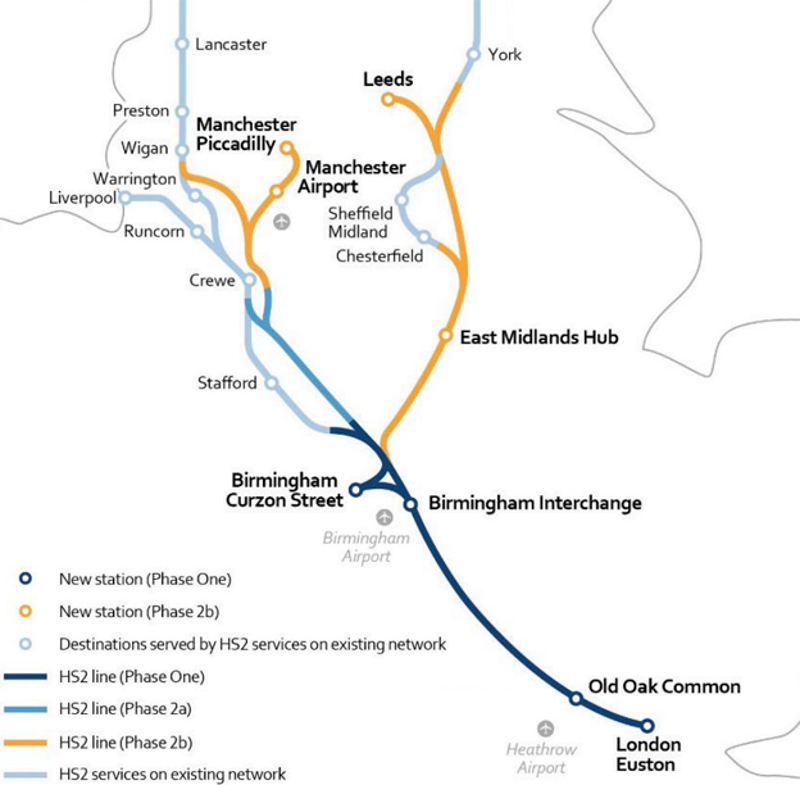 Phase 1 will run from London to the West Midlands whilst Phase 2 will run from the West Midlands in a Y-shaped network linking Birmingham with Manchester and Leeds via the East Midlands. As a result Phase 2 is split in to two sub-phases. Phase 2a will run from Birmingham to Crewe whilst Phase 2b will extend the route from Crewe to Manchester on the West Coast and the West Midlands to Leeds along the East Coast. HS2 will ultimately branch onto the West Coast Main Line just south of Wigan, taking services to Liverpool and on to Glasgow, whilst joining the East Coast Main Line at York, providing a direct link to Edinburgh. Initially announced in January 2010, the Hybrid Bill for Phase 1 received Royal Assent on 23 February 2017 with the passing into law of the High Speed Rail (London – West Midlands) Act 2017. On 15 November 2016 HS2 Limited issued safeguarding provisions for Phase 2b, having issued similar provisions for Phase 2a in 2016. It is expected that the Hybrid Bill for Phase 2a will be introduced into Parliament in 2017, whilst the Bill for Phase 2b will be issued in 2019. This is due to commence in 2018 and open to users by 2026. Phase 2a is now due to be open six years earlier than planned, allowing construction to start in 2020/2021. Assuming Royal Assent for Phase 2b is achieved in 2022, construction will commence in 2023 to enable the line to be fully operational by 2033.